Mammothfest 2017 will take place at The Arch in Brighton, UK on May 6, 2017. 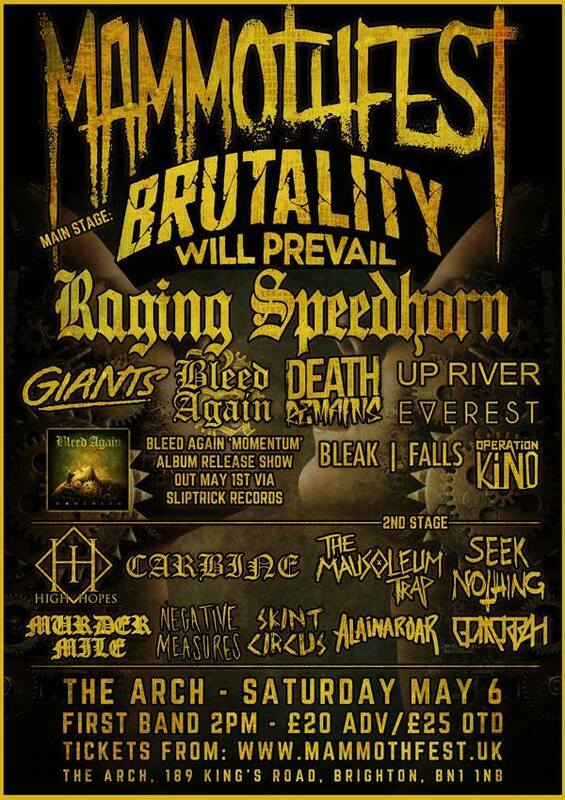 Brutality Will Prevail, Raging Speedhorn and Bleed Again are among the bands that will perform at Mammothfest 2017 festival. Brutal Assault 2014 will take place in Jarome? – Old Army Fortress Josefov, Czech Republic, on August 6-9, 2014. Amon Amarth, Obituary and Sarke are among the bands that will perform at the Brutal Assault 2014 festival. Download Festival will take place in Donington Park, U.K. on June 14-16, 2013. Iron Maiden, Rammstein and Slipknot are among the bands that will perform at the Download Festival 2013 festival.